The Bristol Megahilly was a target for several months. But, at the same time, I was also very relaxed during the race. In the end it went very well. I was surprised how much watts I could put up the last five minute climb – nearly 360 watts for last 5.30, which is pretty close to the magic 6w/kg. It wasn’t so long ago, that I was struggling to do 350 watts for 5 minutes, whilst fresh – let alone after 1 hour 10 minutes of racing. I enjoyed the hilly race a lot, so this week, I planned to have some training rides similar the race. But, it didn’t happen. The legs just weren’t there, and it’s been a quiet week, with several training rides curtailed in effort and duration. I’ve been struggling to replicate racing form into training. Quite a few times this week, ambitious training plans got quickly shelved after a short effort suggested I wasn’t going anywhere fast. It’s a funny thing listening to the body. On Sat, I did a 10 mile time trial, and the next day, I felt even better in the Sunday race. But, the 1 hour and 17 minutes off intense hills, seemed to take a lot out. Sometimes, the best laid plans of mice and men. When you’re legs / mind / heart are not into interval training – there’s no point flogging a tired horse. When it rains why is it harder to train? I was out training yesterday and it was quite wet. When it rains harder why does it become harder to make big efforts? I gave up after a couple of hills, and headed home. I wasn’t sure whether the rain was an excuse or the body was still just tired. Apparantely, the rules of cycling say I should just ‘harden up and stop being a big southern softie.’ or something like that. But, the only thing I seem to get from training in the rain is just wet and cold. When I got home, I poured out a litre of water from my time trial frame, all over my conservatory floor. 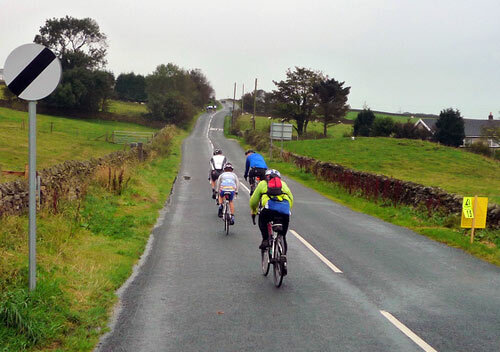 This weekend is just a short visit to Shap Fell and the first hill climb of the season. I’m taking the opportunity to wear the national jersey. I may even get a chance to ride Britain’s major mountain – Great Dun Fell. Good luck climbing Shap Fell Tejvan and wear that jersey with pride as you deserve it. It was once said to me by a pro, relating to practise/training in a different sport, but a comment that I think applies to most. If its cold and wet or you are tired and your mind and body are not interested, then all you will achieve by ignoring those signs, is to perfect your imperfections. Yes, thanks Chris. Fortunately, I’m quite good at listening to those signs these days, and am quite good at the training u-turn. Your not the only one Tejvan… I have also had a ‘flat’ week of commuting since the Mega Hilly TT. Normally i use my commuting time to get some interval/hill training in… certainly not this week. I have struggled this week – weirdly, the legs felt pretty shaky on wednesday, but i managed to turn in a sharp blast of form over a short course. yesterday i really felt rubbish. apologies for any damage caused to training regimes by the absurdly hilly time trial. So nice to hear someone admit to bottling out on a nasty wet day. I got caught in cold wet conditions this week whilst wearing shorts. I would have worn my Endurance Stealth Extreme longs had I known. But I thought “It will make me strong in the head” (as Hinault would have said). Instead I have had three days of sore muscles and joints as a result. What doesn’t kill us doesn’t always make us stronger.